Abstract. We have constructed a regional tree-ring cellulose oxygen isotope (δ18O) record for the northern Indian sub-continent based on two new records from northern India and central Nepal and three published records from northwestern India, western Nepal and Bhutan. The record spans the common interval from 1743 to 2008CE. Correlation analysis reveals that the record is significantly and negatively correlated with the three regional climatic indices: all India rainfall (AIR; r = −0.5, p < 0.001, n = 138), Indian monsoon index (IMI; r = −0.45, p < 0.001, n = 51) and the intensity of monsoonal circulation (r = −0.42, p < 0.001, n = 51). The close relationship between tree-ring cellulose δ18O and the Indian summer monsoon (ISM) can be explained by oxygen isotope fractionation mechanisms. Our results indicate that the regional tree-ring cellulose δ18O record is suitable for reconstructing high-resolution changes in the ISM. The record exhibits significant interannual and long-term variations. Interannual changes are closely related to the El Niño–Southern Oscillation (ENSO), which indicates that the ISM was affected by ENSO in the past. 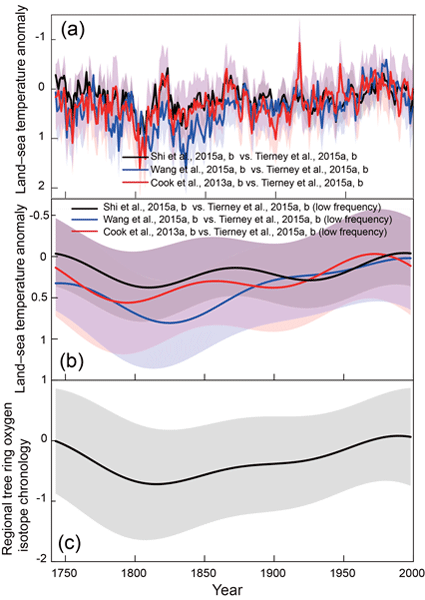 However, the ISM–ENSO relationship was not consistent over time, and it may be partly modulated by Indian Ocean sea surface temperature (SST). Long-term changes in the regional tree-ring δ18O record indicate a possible trend of weakened ISM intensity since 1820. Decreasing ISM activity is also observed in various high-resolution ISM records from southwest China and Southeast Asia, and may be the result of reduced land–ocean thermal contrasts since 1820CE. 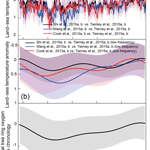 How to cite: Xu, C., Sano, M., Dimri, A. P., Ramesh, R., Nakatsuka, T., Shi, F., and Guo, Z.: Decreasing Indian summer monsoon on the northern Indian sub-continent during the last 180 years: evidence from five tree-ring cellulose oxygen isotope chronologies, Clim. Past, 14, 653-664, https://doi.org/10.5194/cp-14-653-2018, 2018.